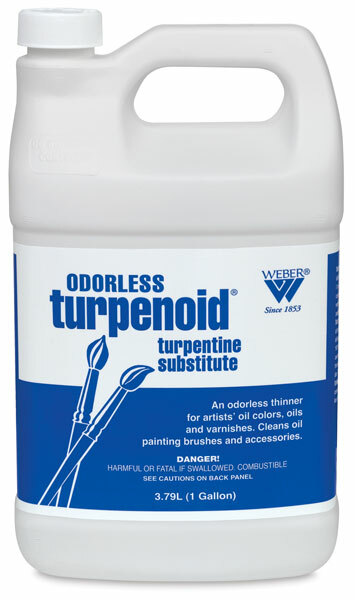 Weber Odorless Turpenoid is a premium artists' medium. An odorless, very volatile, thin, colorless medium, Turpenoid possesses the same painting properties and drying time as turpentine but is free of the strong odor that is characteristic of turpentine. Weber Turpenoid is a premium artists' medium that is the quality substitute for turpentine. An odorless, very volatile, thin, colorless medium, Turpenoid possesses the same painting properties and drying time as turpentine but is free of the strong odor that is characteristic of turpentine. Use Turpenoid with artists' oil colors, varnishes, and mediums. Turpenoid is also excellent as a solvent or paint brush cleaner, and for use in removing paint spots from clothing.